Has anyone tried to accelerate algae growth by the injection of air or neat co2 into the ATS feed pump. Thinking about this so that the alk consumption would be negated in a low co2 environment. Done a few experiments and the lower viscosity seems to increase turbulence and even out flow. That would really lower your pH. I take it that nobody has tried. Not yet anyway! You could get away with adding a calcium reactor, that will drop the ph a bit but it will also adding co2 into the water column. That's a very good point. A calc reactor puts a load of co2 in the system. However I use a d.i.y. Kalk reactor which reduces available co2. I can sense that this thread is going scientific! Perhaps the use of vinegar could be beneficial! Well since the kalk helps stabalize levels such as alk and calc, it would really be beneficial to add a calc reactor since it they would compliment each other. Stability of ph and stabilization of alk and calc, while adding a slow addition of alk and calc into the water as well as Co2, would help accelerate it a bit. I use 100mL of vinegar with 2 teaspoons of calcium hydroxide to a gallon of RO/DI when I make my Kalk as a few of us do on here. This addition of carbon does not seem to hinder the algae growth. I used to dissolve arogonite sand with vinegar and dose this. I never saw an improvement on my system. Do you know of anybody that has cast iron positive results? I know Floyd also uses vinegar. 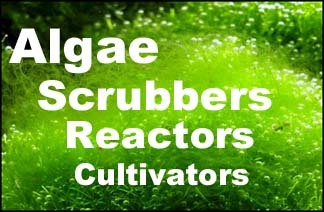 It was questioned whether or not the extra carbon would slow the algae growth. Floyd has not mentioned anything about hindered growth as of yet either. I did do kalk dissolved in vinegar for a while, used it to mix up a 50% strength batch and did that in the ATO. However I could not maintain Alk above 6.7 no matter how hard I tried, and the pH was way low. I decided to make a 2 chamber ATO/Kalkwasser device so that I could control the amount of Kalk being dosed, as the evap method was just not working well, plus the tank has a temp issue with the location, so adding a fan to cool the tank could step up the evap and overdose. However it did not, to my knowledge, impact scrubber growth. Oversized per feeding and need to replace the whole device with something smaller, so I'm going to rebuild the scrubber and then work on the kalk/ATO system. Just too much to do and I can't trust the staff at the office where the tank is located to deal with keeping the kalk in the ATO right.